Build A Website The Easy Way! 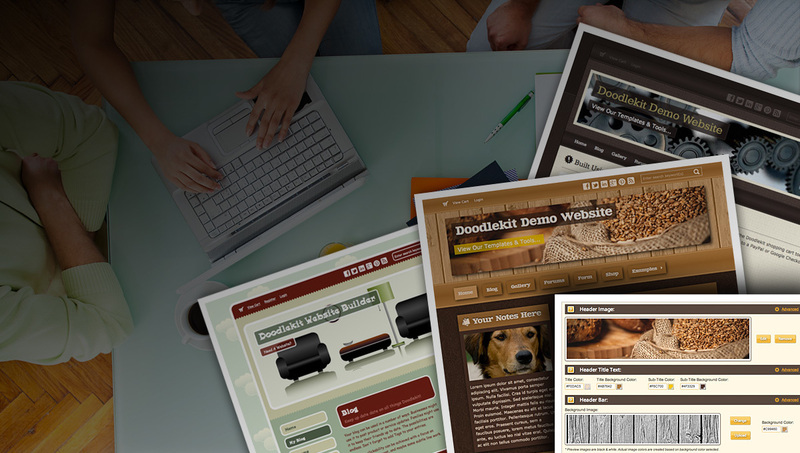 All Doodlekit websites are visible on the world wide web using our advanced cloud network of servers. Website hosting comes with all Doodlekit price plans including the free plan. Read more about our cloud website builders. Upgraded plans come with your choice of one available domain (example: www.mywebsite.com). Domains can also be pointed to your Doodlekit website from a third party domain provider. What good is a website if nobody can find it on the web? Doodlekit provides your with the website tools to help get your website noticed by search engines. Use our template building tools to make a custom template for your website. Change colors, add shadows, make transparencies, round corners, and much more. Once you have made the perfect template, people will ask you where they can get one. With Doodlekit, you can share your templates with whoever you choose. Our template library is constantly growing. We, as well as other users, contribute new templates all the time. Pick any template you want from our collection. Our website tools for blogging allow you to schedule and submit blog posts as needed. They also automatically post related links to other blog posts of yours for you. Use or form tools to create your own custom form. All data is collected and stored in a downloadable spreadsheet format. Form data is also emailed to you on submit. Read more about how to make a website form. The best way to organize groups of people online is by making a forum. With Doodlekit you can create and moderate forums, topic and comments from registered users. Make email addresses based off your website domain. Emails sent to those address are forwarded on to other email addresses that you set. Create albums of images from your image library. Insert those albums into web pages. Click on a thumbnail of an album image and it opens up a slideshow. Make a shopping cart page to sell products and services. Upload and insert your own product photos. Add your own descriptions and product options. Having the option to customize your website design is important. With Doodlekit's website tools you can pick page layouts, tweak colors, add textures, and much more. Make slideshow headers using images you upload. Insert your own logo. Align header images to the left or right of your title text. Add transparencies. Read more about making logos & banners for your website. Pick a font text for your titles and menus from Doodlekit's vast library of fonts. Pick another one for your general content. Change them anytime you want. Set borders on your website to colorful textures, patterns and graphics from our library. Change border colors as needed. Create a theme for your website. Give your website some extra pizzazz by adding plates to your banner images. Pick and choose the plates you like from our collection of graphics and designs. Spice up your website with some cool background graphics and textures. Pick different backgrounds for each section of your website. Change their colors. Read more about background images & patterns for websites. Add files to your website for people to click on and download. Upload documents like resumes, menus, calendar of events, presentations, and more. Know whats going on with your website. Monitor your visitors traffic. Look up visitor locations. See how long visitors stayed on your website. Pick the level of security you want for web pages and users. Only allow certain users to view specific pages and sections of your website. Use our website tools to help promote your website and blog posts on Twitter, Facebook, Google+, LinkedIn, Pinterest, Digg, and more. Doodlekit comes with an advanced page editor that allows you to update your content, insert images, add photo albums, format your text, and much more. Having spammers attack your blog post or forums is no fun. Doodlekit provides you with tools that limit and reduce the amount of spam your website gets. Read more about protecting your website from spam. Create special pages that communicate directly to specific demographics or groups of people. Narrow your focus and call to action. Niche your marketing. Pick a layouts with zero, one or two sidebars. Add a footer bar. Create multiple boxes of content and ads in each bar. Move boxes between bars. Doodlekit allows you to add advertising to different sections of your website. Each section allows you to paste in custom code from the ad service you use. Doodlekit comes with international settings that allow you to change your website's label text to a different language. You can also set your websites timezone. Sometimes you need more control over your web design than what our tools can offer. Use our CSS Code Editor to add your own overriding custom CSS code. Add, remove and hide pages. Make a page only viewable to specific users. Make another only viewable to people logged in. Reorder pages. Turn pages into sub-pages. For more information about our free website builder and the website tools we offer please visit our blog and forums!